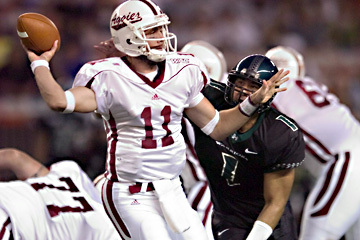 New Mexico State QB Royal Gill found Nick Cleaver eight times for 103 yards and a TD. Nick Cleaver went from substitute to headliner in one night. New Mexico State's backup strong safety shifted to wide receiver for the first time collegiately in last night's 49-28 loss to Hawaii and made an immediate impact. Cleaver, who played both safety and wide receiver at Claremont High School in San Diego, finished with eight catches for 103 yards, including a 3-yard touchdown grab on a pass from quarterback Royal Gill. The scoring catch kept the Aggies close at 28-21 in the second quarter. "I went on an out route and I was hoping to get the ball and was fortunate to catch it for a touchdown," said Cleaver, who went into the game ranked 25th on the team in tackles with two assisted efforts in three previous games and left Aloha Stadium having possibly earned a starting wide receiver spot. But why the switch? And why now? "He was sitting over there, a big guy (6-foot-3, 218 pounds) on defense as a third-string safety and he came to us and asked if there was any other way he could help," New Mexico State coach Hal Mumme said. "He's a natural at it. He only practiced there four days and we definitely didn't coach him on how to be a receiver in four days. All we did was teach him the plays." Cleaver isn't complaining about the change. "I think I like offense better now," Cleaver said. "I'm glad they gave me the opportunity. I wasn't getting the reps on defense. They told me in the spring they might do this, but (last) Sunday is when they told me they were going to try it. I learned the whole offense just this week." Mumme said the Aggies have used about four or five other players in the wide receiver 'Y' position that the coach also refers to as tight end. "He probably had more catches tonight than the others had all year," the first-year New Mexico State coach said. Cleaver would have had nine catches last night had it not been for Kenny Patton's ball-jarring hit on the wide receiver during a short pattern early in the third quarter. But just three plays later, Cleaver made his seventh reception on a fourth and 15 when backup quarterback Joey Vincent lined up as the up back and hit him for 17 yards and a first down. The drive eventually bogged down when the Aggies, who were trailing 35-21, tried another fake punt, but Vincent was sacked by Lamar Broadway. Surprisingly, New Mexico State actually converted another fourth-down fake punt midway through the fourth quarter. Cleaver didn't play on New Mexico State's defensive unit last night, but did take part on the punt- and kick-return, and coverage teams. "I've played special teams all year and I stayed in there tonight. Truthfully, I didn't know how long I would be playing on offense," Cleaver said. "It was possible I wouldn't have stayed in there for as long as I did." With five games left this season for the winless Aggies and two more years of eligibility after that, Cleaver's collegiate path is filled with possibilities. "I think I'll be staying here on offense, most likely," he said.